Home remodel loan gets you 10% more money for your next home improvement project! this purchase plus improvements -- refinance plus improvements mortgage below is not available until further notice. You can still get good refinance home equity loans as a home improvement mortgage. With the purchase plus improvement mortgage you can buy a house at 5% down of improved value up to $500,000 purchase price. Refinance plus improvements mortgage lets you refinance home mortgage up to 80% of improved value. Whether it's a simple home improvement or more elaborate one, you can create your own dream home at a price you can afford. You can combine the cost of renovations and the purchase price into one affordable mortgage. Also available for refinancing your home. These programs are Canada Mortgage and Housing Mortgage Corporation (CMHC) insured mortgages. This great home improvement program is especially helpful as a first time home buyers mortgage. Just in case you have credit problems and need home renovations, we have alternative mortgage lenders refinance bad credit home loans for you too. 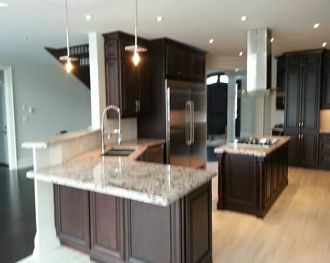 You've found that perfect affordable home you want to buy but it's missing "that one thing" -- a great new kitchen. Kitchen or bathroom renovations are a good "fit" for a purchase plus improvements mortgage or a refinance property to 80% of renovated value. Who are home improvement loans for? These home repair loans are suited to buyers and home owners that require home renovations to their purchased or owned home. Also a refinance home equity loan with the same features. Today’s home buyers, especially the first time buyers, are not satisfied with a ‘starter home’. Most want it all, now. The list is long but the budget is small. With the Government qualification changes in recent years, some buyers no longer qualify for the home prices they qualified for prior to these changes. The home improvements mortgage loan is the ideal solution. This home remodel loan also works for separating spouses - not only they can refinance at 5% down to buy out the spouse leaving the home, but you can renovate your home at the same time. Refinancing and home improvement loan cannot exceed the lesser of 10% of the initial value or purchase price or a ceiling of $40,000. Same rules apply if you would like to refinance home mortgage. As currently you can only refinance property up to 80% of property value -- you'll get more money with this mortgage -- refinance home mortgage equity loan up to 80% of value after renovations. Estimates for improvements will be required up front. Down payment required at sale closing, must include the down payment portion on the original purchase price, plus additional equity for the renovations portion. Because the mortgage amount the lender is lending is based on the improved value, the improvement portion of money will be held in the lawyer’s Trust Account until the lender approves the home renovations and instructs the lawyer to release the funds. Just a reminder, you can make your home energy efficient with just a few "green" improvements that qualify for this mortgage. How a Purchase Plus Improvements mortgage helps a young couple to get their dream home at a price they could afford. You can refinance home equity mortgage under the refinance plus improvements program and get more money to renovate your home. If all of this sounds complicated, don't worry. I will walk you step by step to your fabulous dream home. If you or others you know need a home improvement mortgage - then you've come to the right place. With the easy to use social media buttons you can share this information with others.